Outside of blogging and designing, cooking may be my favorite thing to do. I look forward to creating something yummy at the end of the day, but I don’t always have time to slave away on something all afternoon or spend a ton of money all the time on gourmet food supplies. So I began to get creative. My thoughts were why do things have to be complicated to be good? Well they don’t as I discovered by choosing fresh items that were in season and on sale. Keeping things simple, whole, and open to intepretation depending on what was in the kitchen made me start developing a list of simple, cheap, and yummy recipes. That is where Just 5 developed. The recipes will all be simple and open to interpretation for you so if you want to heat it up go for it! Want to make it sweet, go for it! I don’t cook with measurements typically and tend to never use a recipe so most things are estimated and then taste tested. My goal is to give you all something easy to create everyday that doesn’t break the bank, is healthy, and most of all simple for all levels of cooks. 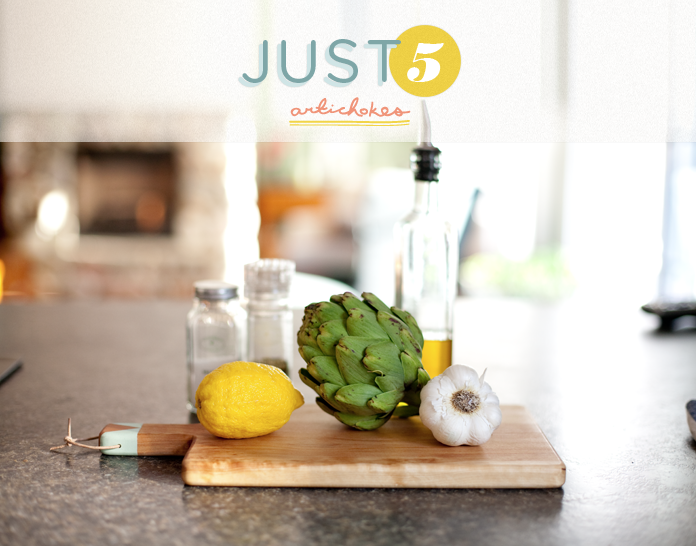 To begin the series I wanted to serve up one of the easiest and simplest of my go-to dishes; the roasted artichoke. 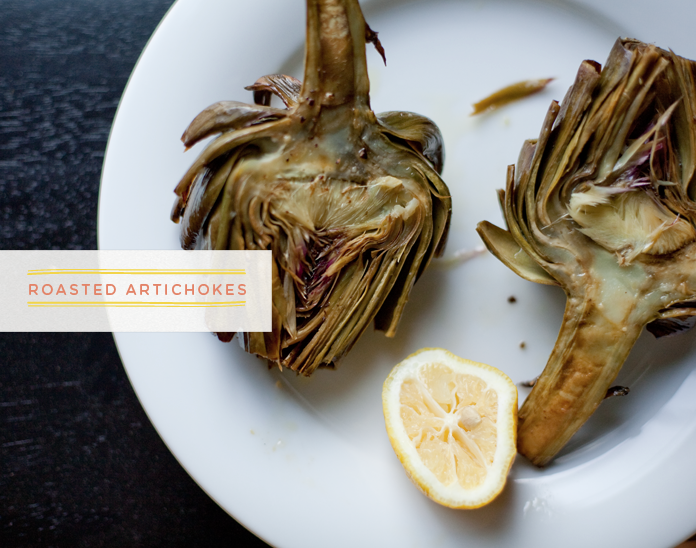 I find that artichokes are very rarely chosen at the store because I think many people aren’t sure how to cook them. It wasn’t till a year ago I took the plunge since I was a little broke and needed something cheap for the week. $1.50 for a little meal seemed perfect! Now I am hooked. The best part about these guys is they are so pretty! The colors and the texture are awesome to see when you cut these guys open. So let’s roll up our sleeves and make some magic happen. 1. Artichoke – one will do if an an appetizer but figure one per person if eating for a meal. 5. Olive Oil – About 2 Tbsp. First heat the oven to 400 degrees fahrenheit with the rack just above the middle of the oven. 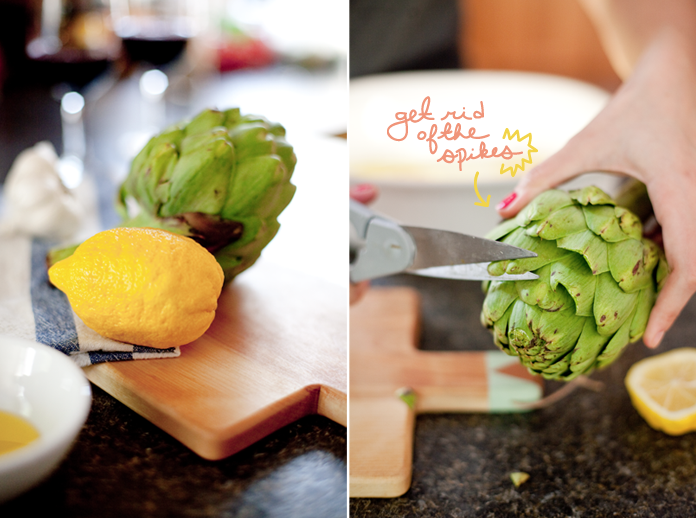 Then begin by washing and cutting off the spiky tips of the artichoke. I usually end up using a knife to cut the top ones off since they are so close together the rest I use scissors. Then prep your baking pan but distributing about a tablespoon of oil around the bottom of the pan. I use a shallow baking dish that is glass. Next slice about half the lemon into thin slices and line the base of the pan. Then slice the garlic into chunky pieces and scatter it over the lemon slices. 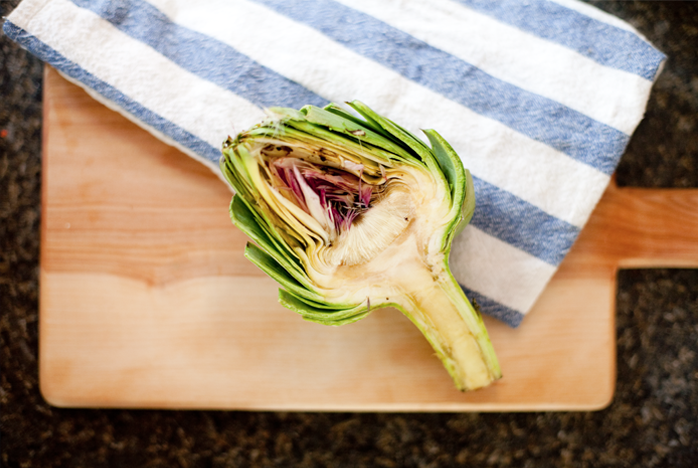 Chop the artichoke in half and drizzle a little more olive oil on the outside and inside and place a little salt and pepper to give it a little flavor. Cover the top with tin foil and place in oven for about 30 minutes or until tender and golden. Once it is complete pull out and let cool for a little before eating. When ready to eat place on a plate and squirt the other half of the lemon over and begin to pull the leaves. Use your teeth to scrape off the meat of the artichoke. Don’t miss eating the heart. That is the good stuff!! Next week: Pesto – the simple and basic style. Love this..what a great idea. 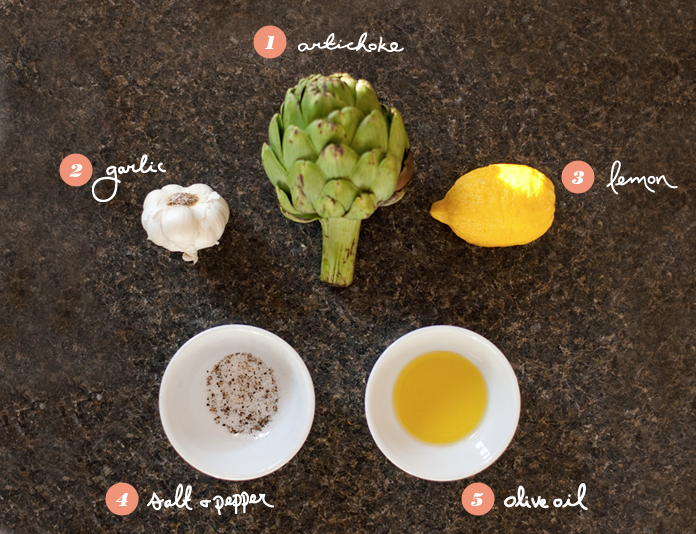 I’ve never been brave enough to try cooking artichokes… just might now! Megan I love this! And you were right on… I get nervous about artichokes! I can’t wait to try this out over the weekend! Love the simplicity! Can’t wait for the pesto!